SnowWolf released its new UltraPusherTE, a skid-steer snowpusher with cushioned sideplates. Urethane die springs make it possible for the UltraPusherTE’s sideplates to flex as much as 10 inches in or out depending on the direction of the strike. In addition to enhancing safety, the cushioning effect also protects the 3/8-inch-steel sideplates from bending. The result is equipment that does not require moldboard-to-sideplate support struts, which cause material buildup in other pushers, SnowWolf said. The UltraPusherTE also includes a 6-inch, high-carbon steel cutting edge, a 9-inch trip edge, floating sideboards and automatic oscillation that keeps the cutting edge on the surface. SnowWolf manufactures the UltraPusherTE’s 6-inch cutting edge with AR400 high-carbon steel. 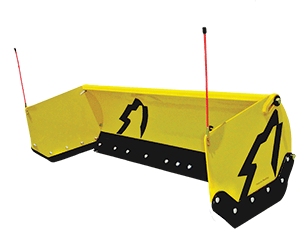 The cutting edge sections are connected to 3-inch steel extensions to create a 9-inch, spring-loaded trip edge that provides maximum safety for operator, machine and attachment, and ample clearance for moving over and beyond obstacles, the company said. Each sideplate is connected to the moldboard assembly with a bolt near the bottom that rotates. A second bolt extending from the moldboard assembly protrudes through a crescent-shaped cutout near the top of each sideplate. The UltraPusherTE also features AR400 high-carbon, high-strength steel sideplate shoes that are angled at the front. When an operator hits something head-on, like a curb, the angled sideplate shoes scrape the obstacle and lift. The sideplates pivot with the lower bolts as their axes, causing the sideplates to rotate upward. The entire sideplate-moldboard assembly rises over the obstacle, and both the attachment and the obstacle are unharmed. Additionally, the weight of the sideplate shoes keep the sideplates and cutting edge on the surface so the snowpusher follows the contours of the terrain. The UltraPusherTE is backed by a two-year warranty.